This is another recipe from Vintage Cocktails that just looked so good based on the photo and ingredients that I had to make it. It's only the second Cognac cocktail I've tried, the first being the Sidecar. I really liked that one, and the Brandy Crusta is actually its close ancestor. While the Sidecar has a simple three ingredients (brandy, Cointreau, lemon juice), the Brandy Crusta gets a bit more complex, with orange curacao, maraschino liqueur, and bitters, plus an incredibly elaborate garnish. And it's a really excellent cocktail. It's more sour than sweet on its own, but with the sugared rim it's perfect - probably one of the few times I've seen a sugared rim actually used to good effect in a cocktail. Oh, and it is strong. A couple of these and you'll be done for the night. So what's the deal with that garnish? 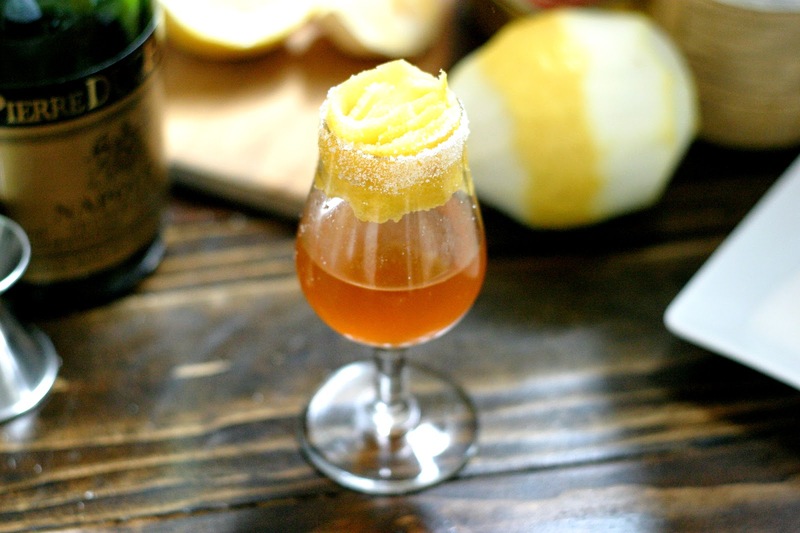 The Brandy Crusta is famously garnished with nearly an entire lemon peel lining the glass or sitting just inside the rim. I couldn't resist attempting to replicate the perfectly coiled peel from the picture in the book, but it was quite an enterprise. It kept falling into the cocktail. I ended up getting out a pair of tweezers to try and pull it properly into place. In the end there was a big gap between the peel and the liquid, but it will just have to do. I think as long as you get a nice big lemon peel in there, you'll get the right taste; as for the look, I'm afraid I've got very little advice. History: The Brandy Crusta was invented in New Orleans in 1852 by bartender Joseph Santini. Some accounts say he invented it at the Jewel of the South bar, and others say the City Exchange, a large restaurant, bar, hotel, and auction house (not to be confused with the Merchant's Exchange that featured so prominently in the history of the Sazerac, though they were similar establishments). Santini worked at both; the Jewel was a smaller establishment that he owned, but he was put in charge of the bar at the ritzy City Exchange as well. Some accounts put the Exchange on Gravier Street, but this is incorrect; the City Exchange took up the entire square block between Royal, Chartes, Toulouse, and St. Louis Streets. Already in disrepair, it was mostly destroyed by the 1915 hurricane. Today the Omni Royal Orleans sits on the site. There is less information on the Jewel of the South, but I assume this is the bar that was on Gravier. Jerry Thomas spent some time in New Orleans in the 1850's and must have come across Santini and his signature cocktail. He included the Brandy Crusta in his 1862 Bon Vivant's Companion and popularized it to a wider audience. The maraschino liqueur is a newer addition to the drink and is not in Thomas' recipe, but it's a nice touch. Combine all ingredients in a shaker. Add ice and shake until chilled. Rub a slice of lemon around the exterior of a cocktail glass and coat with sugar. 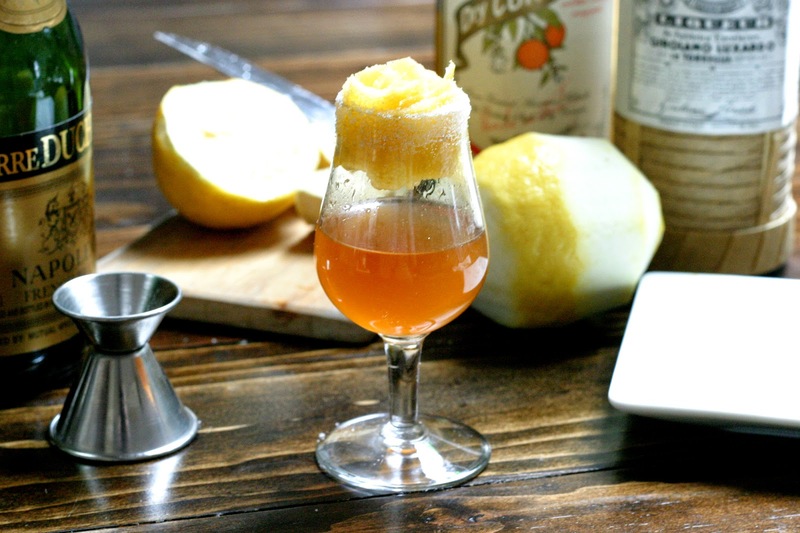 Strain cocktail into glass and garnish with one long, curling lemon peel. Garnish is on a brief hiatus!